Destroyed HHCRS plaque honoring the boys who fought in WWI. 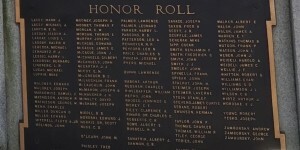 I can just make out the name of my grandfather, second in the center column. 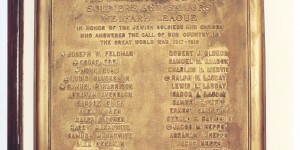 The synagogue once displayed plaques naming the young men from the community who served during WWI and WWII. There are two time periods of photographs here. 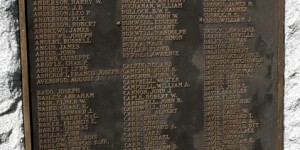 The first, in which the plaques look golden, are of the original plaques erected by the community after each war. These pictures were taken by Lockwood Hoehl just before the synagogue closed. Unfortunately, the original plaques were destroyed in a fire in 1996 along with the yahrzeit plaques and other Homestead Judaica. The second set of photographs, in which the plaques appear dark bronze with gold lettering, are photographs taken by me in fall 2014 of the plaques that were re-made from the original photographs. At the time of the fire, a synagogue staff member said, “Ed Balis, who does our bronze plaques, will redo all of the destroyed plaques as a donation.” These new plaques are hanging in the Homestead Hebrew Chapel at Beth Shalom in Squirrel Hill, Pittsburgh. 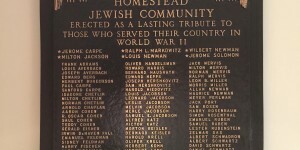 The first WWI plaque was dedicated by the Homestead Jewish Soldiers’ and Sailors’ Welfare League on 9/21/1919 at the synagogue. 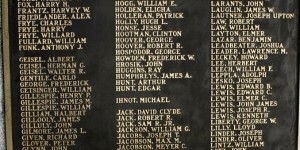 The second WWI plaque was dedicated by the YMHA 2/22/1920 at the Carnegie Library in Homestead. “Maj. E. Lowry Humes and Dr. Samuel H. Goldenson were the speakers,” reported the Pittsburgh Post Gazette the following day. 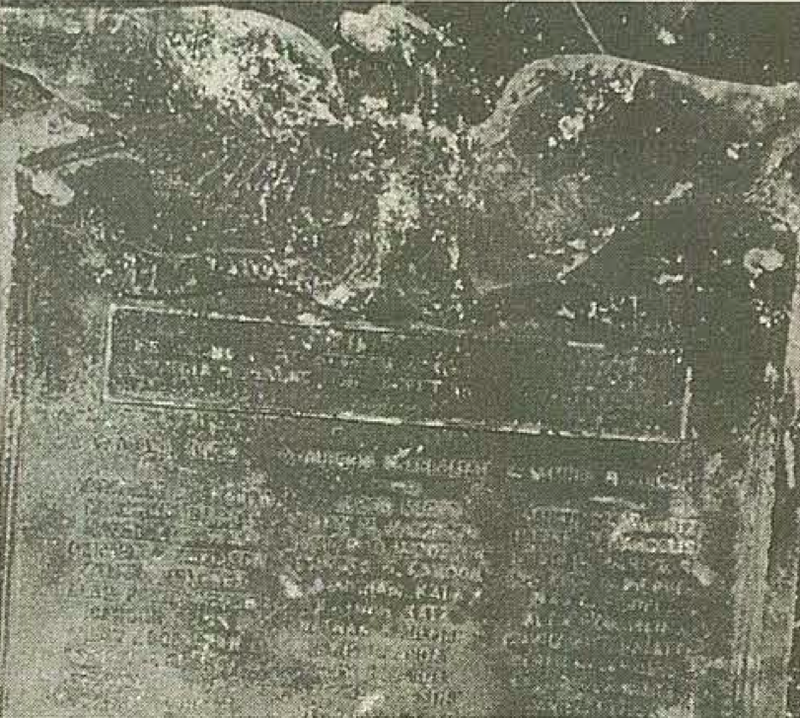 “The tablet was unveiled by Mrs. Libby Goldston of Homestead.” The Criterion had an even longer report. There was a third WWI plaque first came up in the March 5, 1944 meeting of the shul’s Board of Directors, during which, “Mr. Isidor Glick reports that Mr Harry Margolis has given a bronze tablet with the names of all the soldiers thereon who served in World War No. One. Accepted with thanks.” It does not appear that this tablet exists anymore. 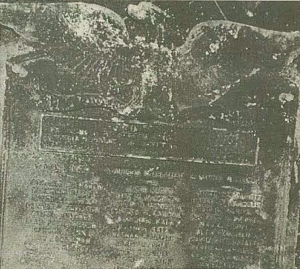 The WWII plaque was first mentioned in the 3/8/1946 issue of the Criterion. The newly-organized Homestead Post No. 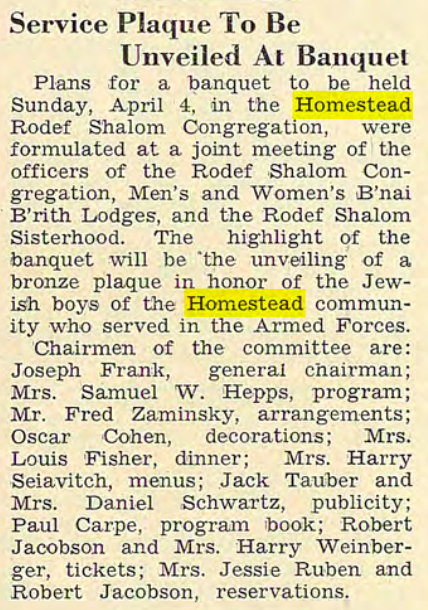 412 of the Jewish War Veterans organized a Purim ball in 1946, from which “proceeds will be used for the erection of a memorial plaque.” At the synagogue discussion of the plaque was first recorded at the January 11, 1948 board meeting: “I. Glick reported the U.S. War Service Tablet has arrived with corrections to be made…Fred Kaminsky reported that the Bnai Brith Comm is making preparations for a joint banquet of all the Congregational organizations in honor of the Jewish War Vets of the surrounding communities on the presentation of the U.S. War Service Tablet.” On March 18, progress in planning the“joint banquet for boys who saw service in WWII” was noted; 75 tickets and $1100 in ads had been sold thus far. 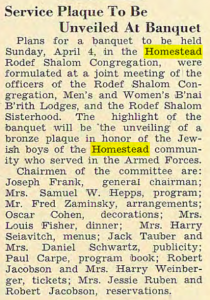 After the banquet, the April 11, 1948 board meeting followed up, “Joint memorial banquet was a complete sell out – Congressman Frank Buchanan from our 33rd Congressional District addressed the banqueteers and was well received by those attended. 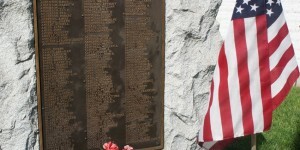 The memorial tablet was unveiled by Mrs. Newman, Mrs. Solomon, + Mr. Markowitz,” parents of the three of the six boys who were killed in action. 1 The total profit from the banquet was expected to be between $800-$900, though I can’t find a final figure since it took time to collect all the pledges. To the plaques, old and new, please click on the first photograph below to enter the slide show of pictures. 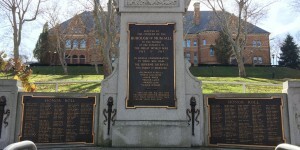 (I’ve also tacked onto the end of the slideshow pictures I took of Homestead-area public war monuments — the WWI monuments from Munhall and Homestead, and the WWII monument in Homestead.) At the bottom of this post below the pictures, I’ve transcribed all the names from the Homestead plaques for easier reading. You can use your web browser to search this page to locate names of your family members. 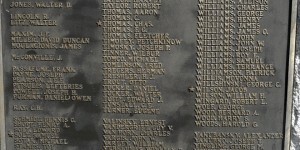 Homestead’s WWI monument: A-E names. 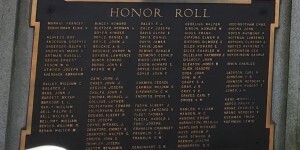 Many names of from the shul plaques appear on these and the next three panels. 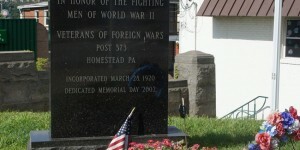 Homestead’s WWII monument at the foot of the Homestead Gray’s Bridge. Note how late it was erected. “The right is more precious than peace. 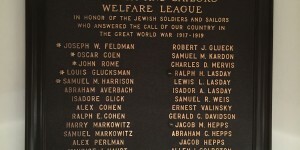 Herman Samuels, my wife’s grandfather, listed on the Homestead Jewish Soldiers and Sailors Welfare League plaque (1st plaque), was a man of some notoriety in the community. He was the long-serving fire chief of Homestead, and died of a heart attack while commanding his men at the scene of a fire in the early 1950’s. Many people have told me about him with pride! I’ll follow up with an email — I’ve been hoping someone would be able to tell me more about him!